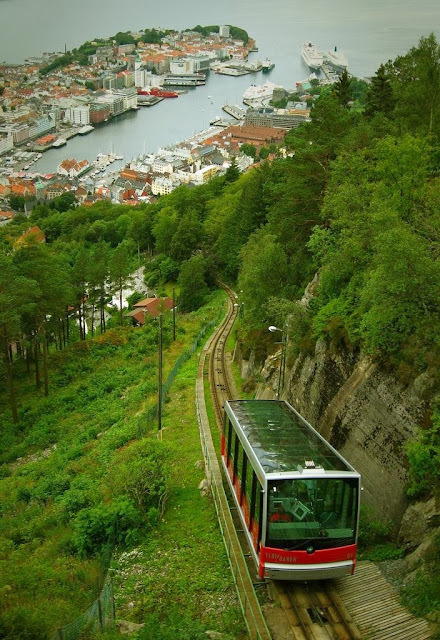 Bergen is a city and municipality in Hordaland on the west coast of Norway. As of 30 November 2013, the municipality had a population of 271,000 and Greater Bergen had a population of 398,300, making Bergen the second-largest city in Norway. The municipality covers an area of 465 square kilometers and is located on the peninsula of Bergenshalvøyen. The city centre and northern neighbourhoods are located on Byfjorden and the city is surrounded by mountains. For this reason, Bergen is known as the city of seven mountains. Many of the extra-municipal suburbs are located on islands. Bergen is the administrative centre of Hordaland and consists of eight boroughs—Arna, Årstad, Åsane, Bergenhus, Fana, Fyllingsdalen, Laksevåg and Ytrebygda. Bergen features a temperate oceanic climate. Areas of the municipality at some higher altitude are largely oceanic sub-polar , with cool winters and mild summers. In the winter, Bergen has the warmest winters of all cities in Norway, caused by the Gulf Stream. Bergen experiences plentiful rainfall, with annual precipitation measuring 2,250 mm on average. This is because the city is surrounded by mountains that cause moist North Atlantic air to undergo orographic lift, which yields abundant rainfall. In Bergen, precipitation is plentiful and heavy rain can happen at any time of the year.